Many yacht owners have a passion for fishing that goes hand in hand with the yachting lifestyle and a luxury sportsfisher is the ultimate combination of the two, allowing you the best of both worlds. Designed to allow yacht owners to indulge their passion for fishing and then retreat to a luxury superyacht setting once finished, a luxury sports fisher pairs form with function in the most impressive way. Although traditionally around the 24-30m mark, bigger and bigger sport fishing boats are being built, with these tailored designs just as suited to relaxed cruising as they are to tackling long fishing trips. With a sports fishing boat you can chase your quarry around the world on a luxury yacht platform tailored for extreme fishing, equipped with all the fishing gear you can imagine. Boasting many of the same qualities of an explorer yacht – robust performance, stability, long range and generous storage – a sport fishing boat is designed to tackle all conditions when in pursuit of a catch. 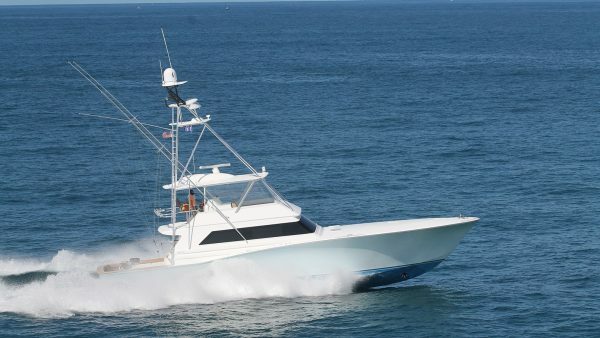 With speed an important factor in following the fish many sportfishers will usually have a performance focused hull that allows quick movement from spot to spot. Plenty of storage will be found on board your fishing boat, ready to receive the bulk of your haul, while your personal chef will be on hand to cook the day’s catch – the freshest fish you could possibly get. All Super Yachts for Sale here.